The Mills Auditory Foundation Raises $25,000! The Mills Auditory Foundation is proud to announce that it has successfully raised $25,000, to support the research of Dr. Rick Friedman, through it 1st Annual Charity Golf Classic! 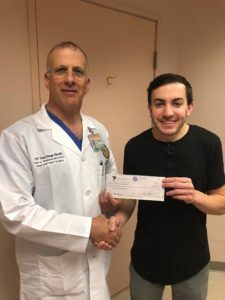 Joey presented the check to Dr. Friedman on Wednesday, December 6th. Thank you to all who participated or sponsored the event, it would not of been a success without you. We look forward to future events and raising even more money to support those with hearing loss!